[Aaron] wrote in to share with us a quick hack that has made his life a little easier. He bought a Rocketfish RF-HV3 portable iPod dock to listen to his music, but he wanted to utilize it as an alarm clock as well. He also found that the speakers worked quite well when he hooked up his Yaesu handheld transmitter to the dock. The only problem he had with it was that the dock would automatically power down when there was no input for 5 minutes. That’s fine when the dock is running on batteries, but if [Aaron] was going to use it as an alarm clock or to listen to his HAM radio, that simply wouldn’t do. He pulled the dock apart and started poking around with his DSO Nano scope. He found that if pin 16 stays low for 5 minutes, it turns off the dock even if there is a signal coming through. His fix for the problem was actually quite simple – all he did was solder the VDD pin to the pin in question, and the 5-minute timeout was disabled. We’re glad that [Aaron] was able to solve his problem in such an easy manner – it just goes to show what you can do with a scope and a few minutes’ time. So it won’t go on standby when using battery power anymore? If so, a little more poking around could have yielded a solution to disable standby only when using wall power. Thoughtful hack nonetheless. Sounds like it powers off after 5 minutes if there isn’t an iPod plugged into it, regardless of wall or battery power. Good sleuthing! Throw in a switch, and you can decide when it should go into battery saving mode. I wonder what frequencies he’s using to transmit the music. Sounds like it could be technically illegal to me. Unless he was retransmitting music that was an incidental part of a shuttle launch with prior approval from NASA, that is. That would be okay. 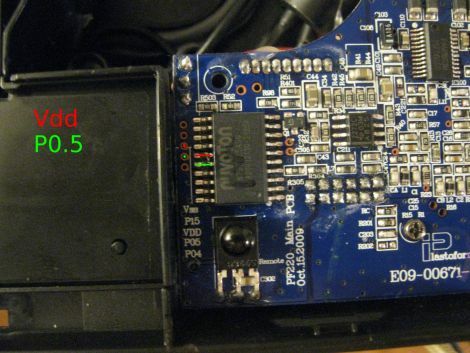 The chip being so crudely modded is a generic MCU whose inputs are VDD-safe according to the datasheet. It’s unlikely that the port pin itself might go into output mode and drive low. By the way, its pins are capable of sinking 20 mA and even then vOL stays at about 0.5 V. That corresponds to 200 ohms. Some other part must drive it low. AFAIK even the old weak CD4000 family can’t be overriden by 1K. He could try 1K (yes, a rather safe value) and see if the voltage remains high enough. If it doesn’t, then the only safe way is to cut the PCB trace, too, so that the signal source is isolated. Or simply stop the time out source from running. Probably by just removing a SMT capacitor. Crude hacks for nerds, dont in ways you should not do it. Measuring signal duration is one of dumbest applications of microcontrollers, and they do that very well using only internal resources. If the MCU has little to do and accuracy isn’t important, it could read the pin in a loop and react to a constant value after a certain number of iterations. I’m oversimplifying but that’s the idea. Otherwise some timebase is set up using an internal timer so that an interrupt occurs each N machine cycles with rather high precision. Those ticks can be counted directly if their frequency is already low enough, or the interrupt handler can reject, say, 99 out of 100 ticks to make this system time (available as a global variable) even slower. In both cases the timeout would depend on firmware and, at some extent, on the oscillator. The latter can sometimes be “hacked” — but not stopped. However an analog quantity connected to a microcontroller pin might be appropriate as a solution for analog user input. A variable resistor can be “read” using ADC — but also using a digital I/O pin and a capacitor. Rotary encoders are much more expensive and require two pins instead of one. Of course a fixed resistor or capacitor can, too, be used as one-time builder’s choice. But that calls for specifically well-documented hardware or a DIY kit. This iPod dock is neither. @Chris Yea. No matter if its on battery or mains, or has a iPod plugged into it if it isn’t playing music through the speakers then its going to turnoff in 5 minutes. @cde I don’t travel with it, so I didn’t feel like dragging out the dremel and hot glue. @Tim Probably but I tested it with a direct connection to Vcc first and never thought of it. Even if I tried I don’t think i could solder a SMD resistor in there without breaking anything. @Brad I’m not using this to TX, only to output stereo sound from my HT instead of the little mono speaker built into it. @holly_smoke the timer itself is built into the MCU, so I couldn’t disable it. Altho the chip can be reprogrammed, I don’t have the original source to edit. From what I’ve noticed the pin (which can be a analog reference, or analog to digital) is simply tied in parallel to the iPod and line-ins left channel. I’m guessing theres an ADC interrupt that resets an internal timer. And if that timer reaches 0, puts it into standby. Its a guess tho, so far its staying on perfectly fine. K.C. Lee wrote a reply on Open PCB Tesla coil.